Buy A4 150 micron laminating pouches for £3.49 and A4 200 micron laminating pouches for £4.70/100. 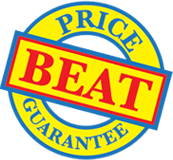 Huge range and fast UK delivery! The cost-effective way to protect and enhance all sorts of flat material. Protect and enhance sales literature, price lists, notices, menus, teaching aids, photos, work cards and much more. Matt laminating pouches are best for outside notices and posters where light reflection may be a problem. Pouches with the suffix "N" at the end of their product code do not have card carriers. If you then want to buy a different type of laminating pouch after you've added one to your basket, simply click on the reset button and select your new options. 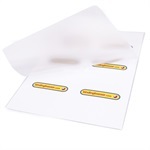 * Card carriers may be useful when laminating using older machines and can help to prevent items wrapping around the laminator rollers where there may have been a build up of glue from laminating over time. If you don't want to use the 'easy ordering' product selector panel, you can simply buy from the list of laminating pouches below.